Timing is everything. When Foxfinder opened at the Finborough in December 2011, it was hailed as `darkly thrilling’ new voice and subsequently earned its writer, Dawn King a glutful of awards from the Royal National Theatre Foundation Playwright scheme to a Pearson Award Playwright-in-Residence bursary. Foxfinder, for want of a better word, is a dystopian vision. There’s a lot of it about these days as King is the first to admit in her interesting interview in the programme. Clearly what she felt seven years ago has become an even greater reality with the fear whipped up before and after Brexit, a Trumpian White House and the Alt-Right preying on fear of immigrants with rich electoral rewards. So you’d think that King’s political metaphor in the shape of an England in the grip of fear of annihilation by the lowly fox with all its attendant aberrations of surveillance and authoritarian threat would certainly have an impact. The strange thing is, though, that somehow – and, as I say, it has something to do with timing – it feels as though we’ve seen it all before. And in much more frightening guise. Namely, The Handmaid’s Tale. King’s Foxfinder is unquestionably, however, a warning, and in most respects, a credible one. We are deep in rural England, in the farmhouse of Sam and Judith, a young couple awaiting the arrival of a stranger who when he arrives looks for all the world as if he’s stepped straight out of a 17th century witch-hunt setting. 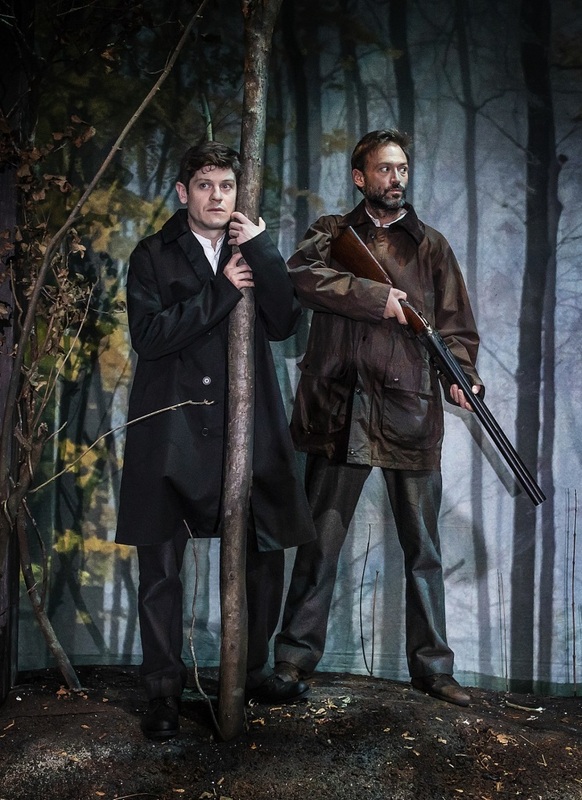 And there begins Foxfinder’s problem because from the outset and as King digs deeper into the mystery of the stranger and his relationship with the Coveys, Foxfinder strikes ever stronger echoes as a contemporary retread of Arthur Miller’s The Crucible. 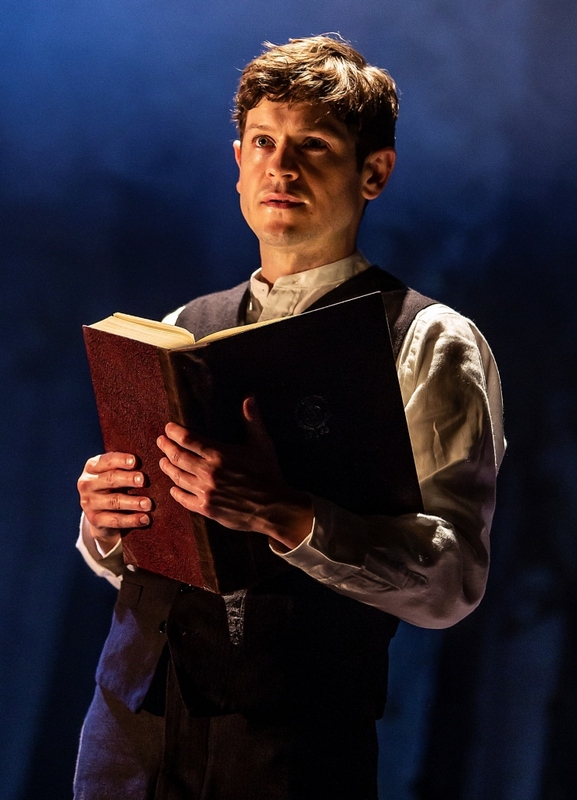 Iwan Rheon’s William Bloor could have stepped straight out of it as a Witchfinder General. Wearing a broad brimmed black hat and rainproofs, young William – he’s only 19 it turns out – has been training since he was five years old for such a posting and has now been sent from central government to check up on the Covey’s farming productivity. It’s down. And with the rain steadily pouring and fields flooded, it’s even less likely they will meet their quota target, thus putting the well-being of the country in danger. To Bloor’s eyes and mindset, the fox lies behind everything. It is everywhere, ready to pounce. There is even, as James VI once decreed in his Daemonologie, a compendium from which he reads, describing the demonic features of foxes and their stratagems in which, as with the belief in witchcraft, the non-existence or invisibility of something can be used precisely to prove its very existence. Fake news and the (il)logic of present day apocalyptic belief is not very far away. King catches that and expounds on it with great skill in the context of seeing the fox as the great enemy and those who argue against its omnipresence as `traitors’ and `collaborators’. 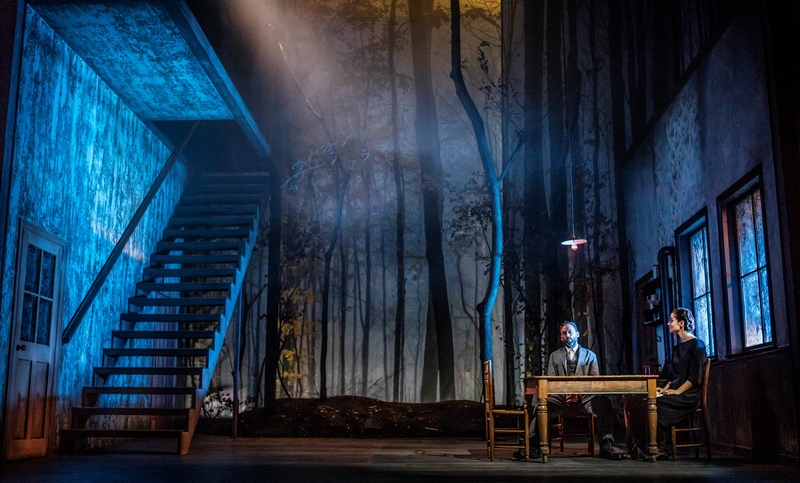 Rachel O’Riordan’s production in Gary McCann’s diaphanously beautiful painted forest and wooden staircase setting do their best to create an emotional and physical landscape of apprehension and increasing terror. Indeed, the last fifteen minutes with Bloor’s mental collapse provide us with the production’s most gripping moments. But in between there are personality and plotting credibility gaps and though a strong cast – Paul Nicholls, Heida Reed (Elizabeth in Poldark), Call the Midwife’s Bryony Hannah and Iwan Rheon produce nuanced portrayals of respectively a stubborn, guilt-riddled husband, a strong-minded wife, a friend who betrays her neighbour to save her own family and Rheon’s quietly fanatical ideologue – the actual venue somehow mitigates against it. Perhaps in the Finborough, the build up of tension, the claustrophobic sense of Nature and the countryside encroaching on human lives might have made a deeper impression. King certainly and very presciently felt the tenor of the times seven years before our present predicament crashed in upon us and elucidates it with almost convincing detail. She’s now evidently much in demand and Foxfinder, apart from having been translated and produced elsewhere (including Germany), is itself being prepared for a big screen version. King has read the runes and I’ve no doubt we can look forward to much more from her. This revival, though, doesn’t quite hit the mark. Very, very strange. 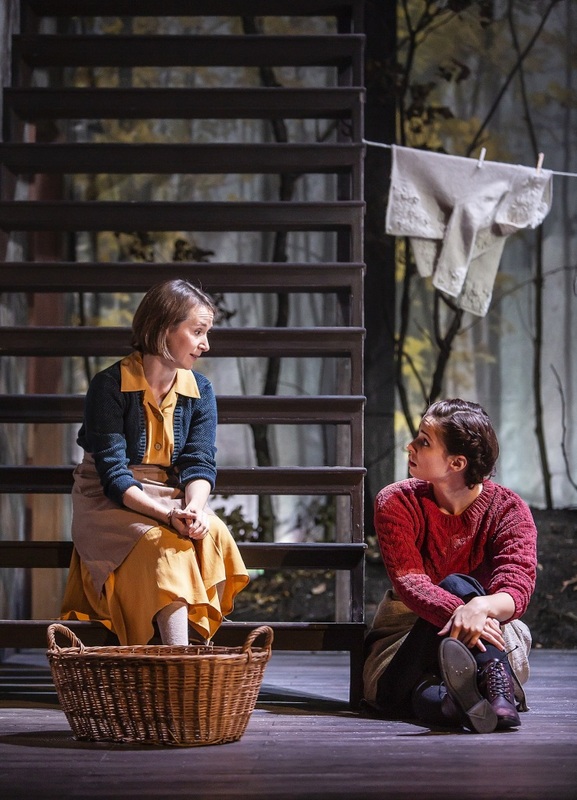 This entry was posted in 2018, Reviews and tagged Ambassadors Theatre, Bryony Hannah, Dawn King, dystopian vision, Finborough Theatre, foxes as metaphor for invasion, Gary McCann, Handmaid's Tale, Heida Reed, Iwan Rheon, Paul Nicholls, Rachel O'Riordan on September 17, 2018 by Carole Woddis.